The College of Liberal Arts & Sciences at SUNY New Paltz invites students, faculty, staff and community members to a discussion with Virginia Eubanks, associate professor of political science at the University of Albany, about how algorithms, data mining operations and other automated systems are being leveraged against poor and working-class people in America. 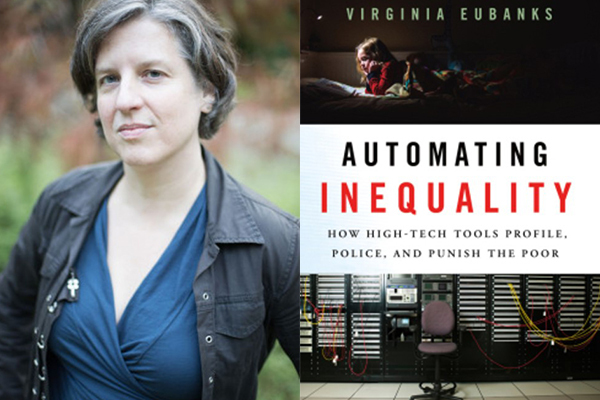 “Automating Inequality: How High-Tech Tools Profile, Police, and Punish the Poor,” the latest installment in the Without Limits: Interdisciplinary Conversations in the Liberal Arts series, will take place on Tuesday, Feb. 5, at 5 p.m. in Lecture Center 102. It is free and open to the public. This event shares a title with Eubanks’ most recent book, in which she systematically investigates the impacts of data mining, policy algorithms, and predictive risk models on poor and working-class people in America. Deeply researched and passionately written, “Automating Inequality” uncovers a network of invasive and punitive systems that determine which neighborhoods get policed, which families attain needed resources, and who is investigated for fraud. Eubanks tells moving and eye-opening stories of real people living in fear of how their statistical profiles are interpreted by mechanized processes. Eubanks appeared on the Feb. 19, 2018 edition of the NPR program “All Tech Considered” to share stories from the book. Listen below, or use this link. Virginia Eubanks has worked in community technology and economic justice movements for more than two decades. She is a founding member of the Our Data Bodies Project, a Fellow at New America and the author of “Digital Dead End: Fighting for Social Justice in the Information Age.” Her writing about technology and social justice has appeared in Scientific American, The Nation, Harper’s, and Wired. This event is sponsored by the College of Liberal Arts & Sciences, Campus Auxiliary Services and the Benjamin Center for Public Policy.